This could be news from either today or like five years ago. The Final Fantasy X/X-2 HD bundle came out in 2013 for PS3 and the Vita, then again for PS4 a few years later. Then XII: The Zodiac Age came out for the PS4 in 2017. If you’re a PS4 owner and you somehow missed these titles, you can probably stop reading now and pick them up. If you are a Nintendo Switch or Xbox One owner, I have good news for you. This news is from today! That’s right, Final Fantasy X, X-2, and XII are no longer exclusive to PlayStation platforms. Xbox One and Nintendo Switch users will now be able hear the sweet sound of Tidus’s laugh again. These games are still a couple of months off though. 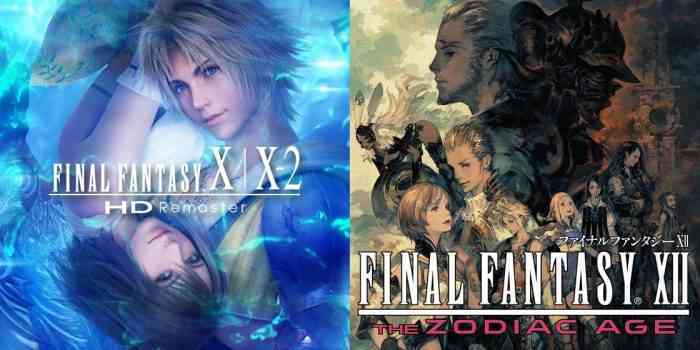 The Final Fantasy X/X-2 HD bundle comes out on April 16th, and Final Fantasy XII: The Zodiac Age comes out on April 30th. They are both available for pre-order now. If you are feeling nostalgic or you have never played them, both trailers are down below. As mentioned above, they can both be pre-ordered, but why is that exactly? Are there any bonus items? Nope. Different skins? No. What benefit is there for pre-ordering? Pretty much nothing. You can get it on launch day and it won’t be any different that pre-ordered. There are some new features coming to Final Fantasy XII though. Both Switch and Xbox One versions have licence board reset functions, three options for gambit sets, and a New Game+ that brings items from the previous save file. The PS4 version doesn’t have those. The Xbox One version also claims to run at 60FPS, but you know, we’ll see about that, Xbox One. Will you be pre-ordering these titles or will you get them launch day? Let us know in the comments below. Fallout 3 Remaster may be on the Horizon – Follow the Signs!